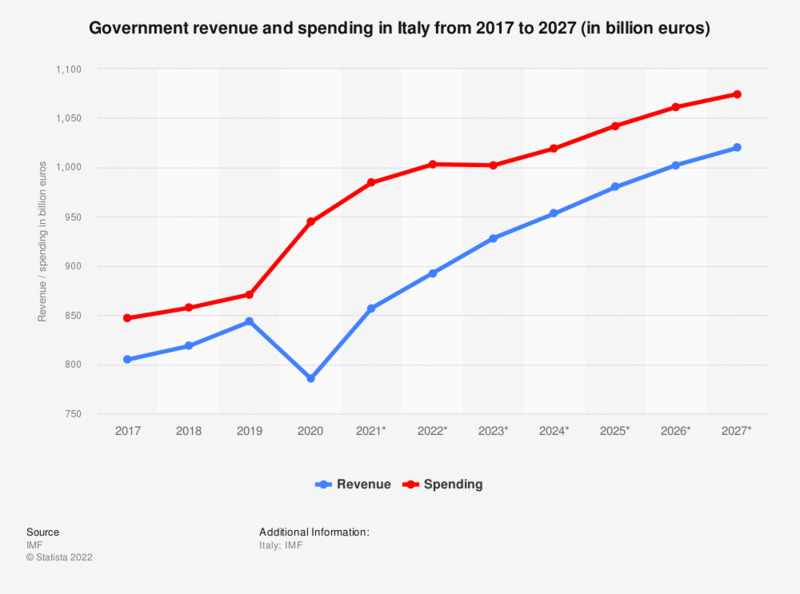 The statistic shows government revenue and spending in Italy between 2012 and 2017, with projections up until 2022. In 2017, government revenue in Italy amounted to round 799.91 billion euros, whereas government spending came to around 839.6 billion euros. Government revenue and spending in Italy have been steady at around the 700 billion mark since around 2008; in no year subsequent to this has the Italian government’s revenue or income exceeded its spending. This imbalance of the budget has led to a deficit. The shockwaves sent through the world in the wake of the 2008 financial crisis are still being felt on the Italian peninsula. The combined factors of less than impressive economic growth, not particularly rosy credit conditions and rising unemployment is having a significant impact on domestic industry, which is facing considerable financial difficulty. A further contraction in Italian GDP in 2013 was indicative of a rather bleak picture in Italy. Economic problems have not been helped by the political crisis the country has been experiencing. The political turmoil engulfing the coalition government, triggered in part by former Prime Minister Berlusconi and his party’s unrealistic pledge to end austerity, caused government bond yields to soar. After a protest mass resignation of MPs from Mr Berlusconi’s party, the Italian president intervened stating the nation’s requirement need for constant break ups and the need for a stable government. Business leaders in Italy have also voiced their concerns and warned that any new election would probably result in another stalemate leaving the future of the country uncertain and worrying the financial markets.